"Greater love hath no man than this: that he lay down his life for his brother." - The Lynchburg Life Saving and First Aid Crew, Inc., motto, 1934. On the night of March 26, 1934, a small group of 11 young men assembled in the attic of the Diuguid's Mortuary to discuss two very serious events which affected their city of Lynchburg during the winter of 1934. The first event, which happened on the night of February 10, 1934, was a fire that broke out in the McGehee Furniture Company building. The weather was a big problem for the firefighters that night with temperatures well below freezing. Heavy ice coated the building, streets, fire apparatus, and the firefighters themselves. Pictures of this event are on this page (thanks to Jessee Bryant). During the incident 6 firefighters, who were nearly frozen or became overcome by the dense smoke, were taken to the hospital. There was no immediate treatment available at the scene of the fire. The second event happened on the morning of March 25, 1934, at the Lynchburg Transient Bureau, a government established facility to care for wandering men who had no food or place to sleep. While a cook was preparing breakfast for the 200 men who were sleeping at the facility that night, a fire started in the kitchen, resulting in the most disastrous fire in the City's history to date. A total of 22 men were burned to death and approximately 75 men were admitted to the hospital. Many physicians were called to the hospital and every available hearse, truck, and car was put into service. The next day 11 young men (mostly firemen and police officers) discussed at length the recent tragedies that happened in their City and talked about the possibility of forming an organization of volunteers that would render assistance to their fellow citizens and countrymen in emergencies and life threatening situations. It was during this meeting in 1934 that they established and founded the Lynchburg Life Saving and First Aid Crew. The original volunteer members of the Lynchburg Life Saving and First Aid Crew were: A. V. Englert, Captain; Bransford Adams, First Lieutenant: Billy Montaque, Second Lieutenant: Lawrence McWane, Sergeant; V. Howard Ford, Secretary and Treasurer; Fred McWane, Jr.; C. O. Deaner; Harold Dudley; Bill Hill; Percy Nowlin; Lewis Staton; and Marion Windley. Soon after the Lynchburg Life Saving Crew was created, a Board of Directors was formed. The original charter members of the Board of Directors of the Lynchburg Lifesaving and First Aid Crew were: Fred McWane, President; Allen Watson, Vice-President; Dr. John Wyatt Davis, Jr., and Dr. W. T. Pugh, medical advisors. The first several months of the Lynchburg Life Saving Crew was dedicated to training and fundraising. Captain Englert was the only first aid instructor who instructed the Life Saving Crew members in first aid and various types of life saving work. While the members were learning their skills, funds were sought for equipment and operational expenses. The very first donation to the organization was received in late March of 1934 in the amount of $25.00 from J. C. Hudgins, the Secretary and Treasurer of W. D. Diuguid, Inc. The Life Saving Crew sponsored 2 amateur boxing matches in the summer of 1934 and the annual Bibee's Benefit Ball was given in their honor in January, 1935. Our first fundraiser, held on our first anniversary date in March of 1935, was a huge success for that time raising $360.00 in donations from the citizens of Lynchburg. Our second annual fundraiser in March of 1936 raised $1,762.00 in donations from the citizens of Lynchburg. 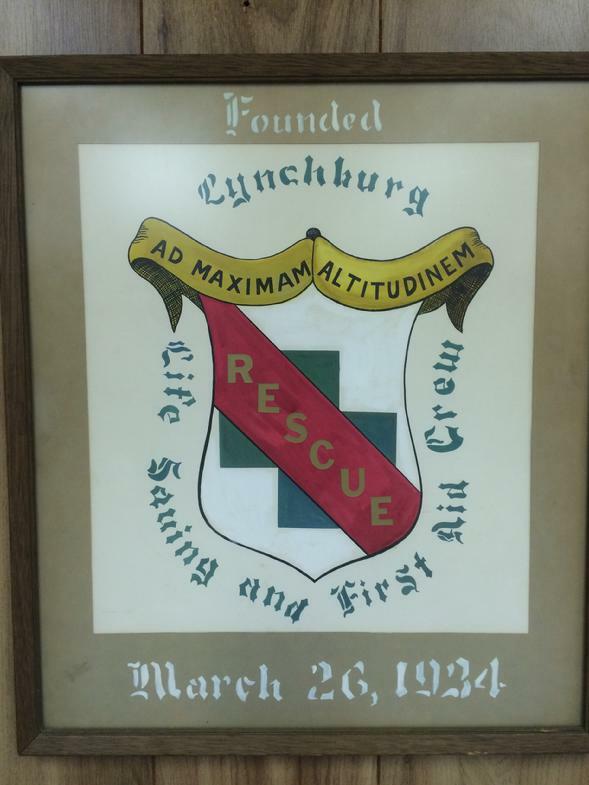 The strong financial base of the Lynchburg Life Saving Crew was established. The first piece of equipment: In July of 1934, through the generosity of our friends at the Roanoke Life Saving Crew, we received our first Life Saving Crew vehicle. The 1918 Cadillac Ambulance came equipped with enough light rescue equipment to handle most ordinary emergency cases. Our first vehicle contained numerous first aid supplies, a Stokes splint stretcher, two army liters, splints, axes, and grappling irons. The new Ambulance, which was painted all white and assigned to the Rivermont Fire Station, was put into service on September 16, 1934. Other equipment was also soon acquired by the newly formed organization. A local doctor offered his row boat, which was mounted on a trailer, for emergency use. The gift had but one request, that the doctor could use it any time he wished to go fishing. Historical documents note "Six inches of water are needed to be kept in the boat at all times to keep the wood swelled to prevent leaks". Each time the boat was used, the water would be dumped out of the boat before it was hooked to the rear of the Ambulance. The first official residence of the Life Saving Crew was in a room in the Lynchburg Gas Company building. This was where the volunteer members held meetings and where training took place. In the summer of 1934, thanks to the City Manager and the City Council, our headquarters was moved into a very large room on the first floor of the City Hall Annex, located at 11th and Church Streets. On January 15, 1935, the Virginia Association of Volunteer Rescue Squads was created in Roanoke by the Roanoke, Salem and Lynchburg Life Saving Crews. The organizational membership consisted of 10 Virginia volunteer rescue squads with the purpose of promoting and developing additional rescue squads in the state. The first annual association convention was held in Lynchburg on September 28, 1935. In February of 1935, the 1918 Cadillac Ambulance became inoperative. The Life Saving Crew then purchased a 1933 Dodge, half-ton, panel body vehicle from John P. Hughes Motor Company, in Lynchburg. Since the new vehicle had a radio installed in it, the local radio station, WLVA, was used to announce emergency calls to the volunteer members in the City. Later that same month, when the Lynchburg Police Department developed a short wave radio system, a radio receiver and transmitter were installed in the vehicle so that we were able to receive emergency response calls and keep in contact with our vehicle when it was out of the station. The Life Saving Crew vehicle was identified as Emergency Car #99. On March 18, 1936, the James River crested over 24 feet above its normal level. A rescue call was received by the Life Saving Crew to rescue flood victims in the river. On this day, the Lynchburg Life Saving Crew lost its first volunteer member in the line of duty. Kenith Patterson, lost his life by drowning in the effort to save others. The later 1930's saw tremendous growth for the Life Saving Crew. More money was donated to support our efforts, volunteer membership grew, training increased, and the Life Saving Crew's reputation for fast, successful and professional emergency and rescue talents spread across the state. On August 30, 1943, the Lynchburg Life Saving and First Aid Crew applied to the State of Virginia for a Certificate of Incorporation. The application stated the organization's mission, purpose, objective, and business standards of operation. The Officers of the organization and the Board of Directors signed the application document. On October 21, 1943, the State of Virginia approved the License of Incorporation for the Lynchburg Life Saving and First Aid Crew, Inc. In 1948, the Lynchburg Life Saving Crew moved into the new headquarters at 1216 Rivermont Avenue (Next door to Fire Station #4). The building was a renovated store front and was the headquarters of the organization for 22 years. In the early 1960's, the Life Saving Crew's reputation as a dedicated, professional, and successful rescue organization spread. The Life Saving Crew was called and asked to assist with rescue efforts in disasters hundreds of miles away from Lynchburg, from a bridge collapse in Ohio, to Dulles International Airport in northern Virginia for a plane crash that took 95 lives. On August 20, 1969, Nelson County, located about 30 miles north of Lynchburg, received torrential rains from Hurricane Camille. The devastation was the result of an excess of 25 inches of rain in a 5 hour period. The water swept away miles of roads, over 100 bridges, and over 900 buildings. A total of 114 people lost their lives and 37 people were never found. The damage totaled over $100,000,000.00 and the county was declared a disaster area. The Lynchburg Life Saving Crew was represented by many members who, along with their equipment and supplies, remained in the area helping to search for survivors and victims for several weeks. In 1966, the members of the Life Saving Crew asked the City Council for a small piece of land to build a new headquarters. The City Council voted to approve the request and gave the Life Saving Crew the corner property on Page Street and Memorial Avenue to build their new headquarters with the condition that the building must be completed in two years. The total cost of the new building, $165,000.00, was completely funded by fundraising and donations from individuals and companies, using no tax payer dollars. About half of the money raised was received from many people and companies in Lynchburg, with average donations of $35.00. However, one citizen of Lynchburg, Miss Minnie Edmonds, donated more than half of the funds needed to build the new headquarters as a single benefactor. A memorial hangs on the wall of our headquarters building honoring her gracious and unselfish support of our non-profit agency. On February 14, 1970, the Lynchburg Life Saving Crew moved into their new headquarters. The new facility was the finest in the area at that time. It included 8 vehicle bays, a kitchen, meeting rooms, a bunk room, and communications center. The Communications Center was the place where the Life Saving Crew emergency calls were received and dispatched to the members using state-of-the-art radios. The building was dedicated on May 24, 1970. The event was attended by the 43 members of the organization and special guests, including the City Council who had gifted the land. The beautiful ceremony was followed by an organization open house. The Architect for the home of the Lynchburg Life Saving Crew was J. Everette Fauber, Jr., of Lynchburg, the Consulting Engineer was M. Lymann Johnson, of Lynchburg, and the builder was the C.L. Lewis Construction Company, also of Lynchburg. The grand-daughter of J. Everette Fauber, Jr. (Carter Fauber Jennings) was a member of the crew from1998-2005. On the evening of August 18, 1972, the Life Saving Crew lost its second member in the line of duty. Edwin Dudley "Buck" Hook, Jr., the Life Saving Crew Vice President and 20 year veteran of the organization, died of a heart attack on the scene of an accident involving extrication on Virginia Route 460 South in Campbell County. Buck had responded to the scene in his own car to assist fellow Life Saving Crew Members with the accident. On September 12, 1972, the Lynchburg Life Saving Crew purchased a new revolutionary rescue device called the "Jaws of Life" from the Hurst Products Corporation. This newly created hydraulic tool, used to extricate victims from mangled car, train, and plane crashes, was one of the first to be used as a rescue tool in the country and the second "Jaws of Life" to be purchased and used by a Rescue Squad in the state of Virginia. This first Hurst Rescue tool (Serial number 3), was donated to the Life Saving Crew by Dr. Jerry Falwell and the members of the Thomas Road Baptist Church. The tool, which was ceremoniously removed from service in 2001, has helped save countless lives over the years. (The tool is on display at the Hurst Company Headquarters) The Lynchburg Life Saving Crew purchased several other "Jaws of Life" rescue tools from Hurst Products Corporation over the years, along with several hydraulic rams and power plants, which were used to operate the rescue tools. The new hydraulic equipment would see action almost immediately and was put to the test in 1978. Shortly after 5:30am on December 3, 1978, the Southern Crescent passenger train derailed in Elma, Virginia, 35 miles south of Charlottesville. The 12 car train derailment killed 6 people and injured 60 others, most of whom were trapped in the wreckage. A total of 15 central Virginia rescue squads, including the Lynchburg Life Saving Crew, were asked to help with this tragic incident. Members of the Life Saving Crew were among the first to respond and arrive on the scene to help the victims. One member of the Lynchburg Life Saving Crew, Kimball Glass, who arrived on the scene of the disaster with our first crew, became the Chief Rescue Officer on the scene and coordinated the rescue efforts of the responding rescue squads. Crews would work for three days to free survivors from the wreckage as well as recover those who had died. In late December, 1978, the Lynchburg Life Saving Crew accepted the first women applicant for membership to the organization. Jane Blackburn, a dispatcher for the Lynchburg City Police Department, was approved by vote of the Membership and became the first women to be a member of the Lynchburg Life Saving Crew. In the late 1970's, the Lynchburg Fire Department began a program to establish a formal EMS division within their paid ranks. The City of Lynchburg asked the Lynchburg Life Saving Crew if they would consider abandoning their rescue work in favor of running an ambulance service for the city. The leaders of the crew at this time thought that this would go against the mission of the crew and dismissed the request. In hind-sight, this was a short-sighted decision. The City of Lynchburg would formalize their EMS division and began to staff ambulance units in the city. The Life Saving Crew saw their role in the city diminish as EMS became the central emergency work in the city. In the 1980's, the Lynchburg Life Saving Crew lost their United Way funding when a task force decided that they had become "a duplication of services" that were already being offered by LFD. The crew would continue to operate as a peripheral organization, responding to all calls for rescue service as well as being simultaneously dispatched to EMS calls throughout the entire city. In 1984, the City of Lynchburg established a 911 communications center on Clay Street called Lynchburg Communications, referred to as "LYN-COM" during radio communications. This City wide central communications system helped to establish better communications between all police, fire, and EMS services. As soon as the 911 system became operative, the Communication Center located in the Life Saving Crew Headquarters was no longer needed and was renovated into administrative offices for the organization. In 1990, the Lynchburg Life Saving Crew saw most of their emergency medical response transferred to the paid Lynchburg Fire & EMS Department and call volume for the volunteers was cut to a trickle. It became difficult to maintain members, but the crew managed to continue to answer calls for service for all accidents, water rescues, search and rescue calls, fires and serious EMS emergencies. The paid services of the Lynchburg Fire Department had once again marginalized the role of volunteers in the system. In 1998, the Lynchburg Life Saving Crew, seeking to find a new service niche in the City, joined with the Lynchburg Sheriff's Office as members of the Project Lifesaver Team. This group of trained individuals used the latest tracking technology to locate Alzheimer patients who wandered away from home. Realizing that the role of the Lynchburg Life Saving Crew Volunteers was diminishing while calls for Emergency Medical Services were growing, the leadership of the Life Saving Crew met to consider its future and re-examine their mission. In 1998, the Board took the unprecedented action of appointing a new Chief & Executive Director to lead the organization. Dr. Grant L. Azdell, whose work was in non-profit management and higher education was called to serve and requested that long term member/officer Richard Ruggieri be appointed as Asst. Chief. At the time of these appointments, the crew was in debt (more than $150,000) and was facing an identity problem with regard to their role in the City. Chief's Azdell & Ruggieri were charged by the Board to "bring the organization back to a relevant role or close the doors". The two leaders decided to start by getting the finances under control. The entire debt was eliminated by 1999 thanks to the gracious support of several hand-cultivated donors. Once the debt was eliminated, and finances were secured to support an annual budget, the leadership turned their attention to renewing their support of the emergency services in Lynchburg. In 2002, Chief Grant Azdell and Asst. Chief Richard Ruggieri brought a proposal to several members of the Lynchburg Fire Department. The proposal suggested a possible integration design with the Lynchburg Fire Department that would better serve the citizens of Lynchburg in the best possible way, while maintaining the autonomy of both organizations, and saving taxpayers money. City Manager Kimball Payne set up a series of meetings between LFD Chief Cecil "Buddy" Martinette, representatives from the Lynchburg Police Department and Fire Department, Lynchburg Communications (LYNCOM), LLSC Board President (and Police Deputy Chief) Jack K. Lewis, Chief Azdell & Chief Ruggieri. A small task force was established to consider the feasibility of this integration. Led by Battalion Chief Walter Bailey, the committee members included: Chief Azdell, Chief Ruggieri, Capt. Ronnie Coleman , Paramedic Jimmy Mitchell and LYNCOM Operations Director Bill Aldridge. The group took six months to examine the needs of the city and create the new integration agreement. The Life Saving Crew leadership agreed to temporarily discontinue their traditional automobile extrication and rescue response and focus primarily on Emergency Medical Services. in March of 2003, sixty-nine years after their first meeting, the Lynchburg Life Saving Crew resumed their EMS role in the city with one ambulance (a 1998 Ford Type III) and a first-due response area. In 2004, the Lynchburg Life Saving Crew celebrated 70 years of service to the community. During this celebration, past members assembled and marveled at how the department had come full circle. With a second ambulance on order (2005 International MAV) and promises of new opportunities to serve by the City, the LLSC continued to expand their service to the citizens of Lynchburg. In 2008, Chief Azdell moved out of the area for a new job and stepped down from the leadership role that he had held for 10 years. The Board of Trustees appointed Asst. Chief Kristin Morgan to the role of Chief. The appointment of Chief Morgan was another milestone in the history of the crew. She was the first female Chief in the crew's 74 year history. The crew continued to advance under her capable leadership until family relocation forced her premature departure from the crew in July 2011. Former member Samuel Green was tapped to be the Chief in 2011 and continued in that role until the early part of 2012. As the Life Saving Crew neared the celebration of our 79th anniversary in 2013, they were faced with a new challenge, one that sadly would come from an unlikely place. In December of 2012, the City of Lynchburg and the Lynchburg Fire Department suddenly, deliberately and unilaterally pulled the LLSC out of the 911 dispatch system, leaving the volunteers out of the City's Emergency Response Plan. When questioned about the decision by the Crew's Board, the Fire Chief would only say that the Mayor (Gillette), City Manager (Payne) and he had met in a closed door meeting and had made this decision. The Mayor would later say that operating the Crew had become "too expensive" and drained City resources. When pressed on this statement by a local News & Advance reporter, the Mayor would only say, "If were gonna have to coordinate with another group in order to take a call, that takes planning, it takes staff time". This statement was even more confusing to the Crew Board given the fact that calls for service are automatically handled by a seamless Computer Aided Dispatch (CAD) system that requires no additional effort on the part of City staff to manage. When the Crew was in service, they were simply added to the same system that manages all of the calls for emergency services in Lynchburg. When the Crew was out of service, the "first due" areas simply collapsed back to a LFD only response. It literally takes a click of a computer mouse to make it happen. It was clear to the Board that the Mayor had been completely misinformed by members of the Fire Department. It was also evident to the board that the decision was intended to put the Lynchburg Life Saving Crew out of the EMS response business. At the time of this decision, the City of Lynchburg had already cut all monetary support of the LLSC and in fact, was billing citizens for the free service that the LLSC provided. The suggestion that the Crew cost the City money was absurd given the fact that the City had completely discontinued the Crew's fuel allotment and had eliminated any money that had previously been provided by the State to the Local government, keeping 100% of this support for the sole use of the Lynchburg Fire Department. In addition, the City had no problem retaining 100% of the revenue that had been generated by the volunteers (performing transports) from the prior 10 years. At the time the Crew was removed from 911 services, they were operating 100% on the donations they received from the Community. No taxpayer money was being used to support their non-profit emergency work. Suddenly, the agency that, then Councilman Gillette had once called "...the best investment the City had ever made..." was left to figure out what might be next. The Board of Directors decided that one of the oldest volunteer rescue squads in the Country would not allow themselves to fade away. As they had done many times before, the Crew re-examined their mission to the Citizens of Lynchburg. During all of 2013, the Crew continued to teach CPR classes and host local service groups in their headquarters building on Memorial Ave. The Board also awarded two educational scholarships to students enrolled in CVCC's Paramedic program. Realizing that the City of Lynchburg controlled who would respond to emergency calls and that it would be impossible to recruit, train and retain volunteers whose talents would be un-utilized. A unanimous vote of the membership allowed the Board to re-direct the LLSC mission to one that would embrace this new educational role. In December of 2013, the Board formally announced that they would focus on community CPR, First Aid & EMT training, by establishing a training center at their headquarters building. They also formally announced a new scholarship for students who are preparing for a career in a medical field or pre-hospital setting, and a public Automated External Defibrillator (AED) grant for area businesses. By January of 2017, over 500 students had benefited from these classes. Members and Board Members are being called upon to teach a variety of EMS related classes at the LLSC building. Even Life Member Mike Smoot served as a part of the new focus as he agreed to offer Emergency Vehicle Operations Courses (EVOC) to first responders. As the crew enters their 82nd year of existence, they do so with a renewed purpose while remembering the dedication and sacrifice of the brothers and sisters who came before us. Three years after the City decided to pull the volunteers from the 911 response system, the Volunteer Members of the Lynchburg Life Saving Crew are still waiting for an explanation as to why the decision to remove the Crew from 911 calls, was made. Curiously the City of Lynchburg gave up all their long-held monopoly on city-wide transports in 2014, contracting with outside agencies to perform all of these non-emergency transports for the Lynchburg Fire Department. The Volunteer Board Members from the Lynchburg Life Saving Crew made inquiries as to why they were not considered to perform this role, saving the taxpayers millions in lost revenue. That question has also gone unanswered.